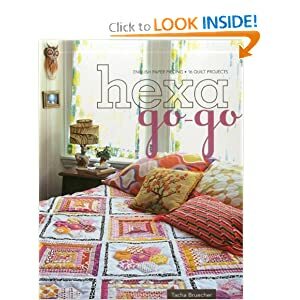 I had a gift card to a cute little Quilt Shop here in town and decided that I was going to buy a pattern book or something similar with it. I have some books and I love looking through them to get ideas or have things ready when I decide to jump into a sewing project. After a quick scan through, I loved it! All their pieces have a very modern look and it lets me play around with English Paper Piecing, which I haven’t done much of (much meaning, none at all). I was so happy that next week when I was browsing through the Spring Stampin’ Up! 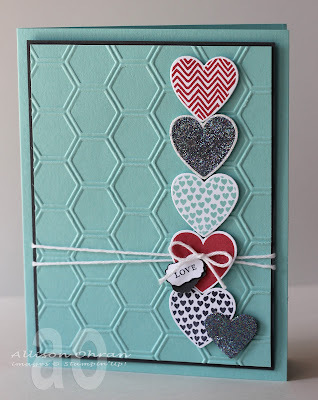 catalog and saw the hexagon pattern in an embossing folder! I did my first order through Stampin’ Up! today and the first thing on my list was this folder. Here are some fun cards that caught my eye using this folder. I’m looking forward to being a Stampin’ Up! Demonstrator and using my current creativity surge to make some fun projects and encourage people that they are capable of being creative! Last night I went to a Stampin’ Up! Christmas party with my friend who is a consultant. Since this was their Christmas meeting they had a gift exchange for handmade gifts. I have enough SU! products that I knew I could put something together for it. One of my current favorites in the catalogs is their fabric that matches the paper lines. I checked out Pinterest and decided to make these sleeves with a couple of retired fabric lines. I made two sleeves, one with Christmas fabric and a spring fabric. I loved how they turned out and they use so little fabric that its a great easy gift for friends. Here is the view of the first side. I grabbed two cups from my local coffee shop to make sure they fit and gifted them on the cups. I also love that Stampin’ Up! coordinates everything so I was able to grab matching buttons for both sleeves. That blue fabric is part of the Springtime vintage line that I think is my new favorite. They have 3 fat quarters for a dollar in their clearance rack so I think I may pick up a couple more boxes before they run out! I also like these kind of sleeves because I can actually fit them through the handle of some of our smaller mugs which would make drinking tea a lot easier.